Do you often face Outlook management issues? Sometimes Outlook email management becomes a challenging task for users. If you’re tired of using different tools to manage PST files, you should now consider using the PST Manager tool provided by Shoviv Software. Microsoft Outlook creates an Outlook data file that contains email folders, contacts, addresses, and other data. If the Outlook client is being used as a stand-alone application, the Outlook data file is saved in PST (personal storage table) format. The Outlook email management issue is primarily associated with the Outlook data file. For any Outlook user, it’s very important to learn how to manage PST files so that the work can run smoothly. Although Microsoft Outlook is a great email client, there are various issues you may come across while using it. Are you having trouble with Microsoft Outlook? Don’t worry, most of the issues can be easily be easily fixed once you know how. One of the most common issues faced by Outlook users is PST file size limit. A PST file has a definite size limit. For example, Microsoft Outlook 2002 and the earlier versions save PST file in an old format called ANSI. The maximum size limit of an ANSI PST file is 2 GB. This means you can’t store more than 2 GB. The newer Outlook versions like 2003 and later use the Unicode format to save PST. The maximum size limit of a Unicode PST file is 20 to 50 GB. Remember, whenever a PST file reaches its maximum size, Outlook users start facing troubles which include performance issues and corruption. In such a situation, you should split PST file into two or multiple parts. And if you don’t want to split PST file into multiple parts, it’s better to compact its size. Why do you need to compact PST file? Remember, the more emails you send and receive, the larger your Outlook mailbox will grow. And whenever the mailbox becomes large, it may take longer to open and search. If you receive a message saying that the mailbox is over its size limit, you should definitely delete the emails and the folders from the PST file. But it ain’t done yet. You don’t get free space automatically when you delete items from the PST file. There’s one more thing you need to do here. You need to compact PST file size. This will remove all the unused space from the PST file. While using the Outlook client, receiving duplicate copies of an email message is a very common problem faced by users. Beyond an email message, a duplicate item can be anything like contact, calendar, note, task, or a journal. Apart from incorrect rule settings, there are various reasons why duplicate items occur in Outlook data file. Let’s suppose one of your Outlook data files contains a large number of duplicate items. This will surely increase the size of your PST file. As discussed earlier, an oversized PST file is prone to severe issues including corruption. If you have just a few duplicate items, you can remove them manually with ease. But when there are thousands of duplicates, you need a professional solution like Outlook Duplicate Remover tool. There’s a lot of information stored in numerous PST files. And if you want to access all the information stored in multiple files, you need to open them one by one. This may require a lot of time and manual effort. If you open multiple PST files at a time, the Outlook client may slow down or freeze. In such a situation, you should merge Outlook PST files into a single file. It’s always better to keep one PST file instead of numerous files. Have you forgotten or lost PST password? The password protection feature of Microsoft Outlook enables users to protect PST files with a unique password. But sometimes it may happen that you lose or forget the password of your PST file. If a PST file is protected, it can only be opened by entering the correct password. But if you’ve lost PST password, there’s no way to open the file. In such a situation, you have to unlock PST file either by removing the password or recovering it. When it comes to Outlook management, users should always consider using a professional solution like the PST Manager tool. This multi-functional tool provided by Shoviv Software is definitely worth trying. Don’t worry if you’re a novice user because you don’t any prior technical expertise is to use this PST Manager tool. All the applications included in this toolkit contain an interactive and intuitive user interface. Before purchasing the licensed version of this software, you should download the demo version for free evaluation. The PST Manager tool is a pack of 5 utilities smartly designed to perform their respective roles to handle various Outlook management issues. PST Split Tool: If the Outlook management issue is primarily associated with the file size, it’s better to split PST file into two or multiple parts. The PST Split utility of this toolkit allows you to split PST file in a safe and effortless way. Instead of splitting the original PST file, it creates two or multiple new output files into which the mailbox data of the main file will be saved. Compact PST Tool: The PST Manager toolkit contains Compact PST tool that can also fix the PST file size issue. If the PST file has reached its maximum size, you should use this software to compact PST file size without causing any data loss. There are multiple options to reduce PST file size. Outlook Duplicate Remover: The Outlook data file increases its size when it contains a large number of duplicate items. By using the smart Outlook Duplicate Remover tool, you can successfully remove duplicate emails and other items from the PST file. In this way, you can manage the PST file size and avoid the Outlook email management issues. PST Merge Tool: If you have a large number of PST files and you find it hard to manage them, you should merge PST files into a single file. In the PST Manager toolkit, you get the smartest PST Merge tool that offers three ways to merge PST files: Merge PST, Join PST, and Merge Contacts. PST Password Recovery: The PST Password Recovery software in this toolkit will help you unlock PST file if you’ve lost or forgotten the correct password. Users often face a lot of trouble while working with Microsoft Outlook. In this article, we’ve discussed the most common issues primarily associated with Outlook management. 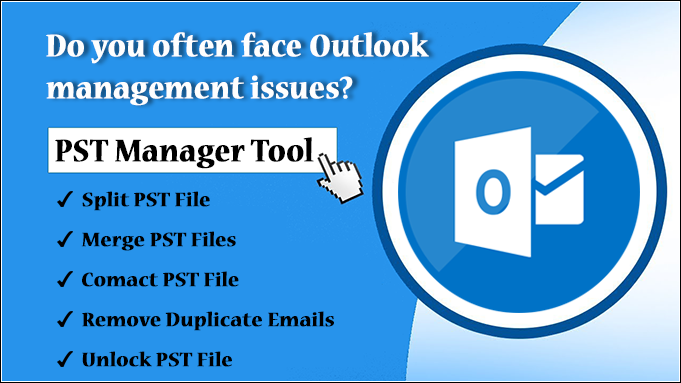 So whatever your concern is, the PST Manager tool mentioned in this article will make Outlook management task easy and effortless for you. Whether you have an oversized PST file or the files are large in number, this smart solution will help you manage the files. Even you shouldn’t worry if you’ve lost PST password. This toolkit contains something that’ll help you unlock PST file. Overall, it serves as a perfect solution to manage PST files.